So yes, Berkeley is known for protests. It got to a point when I was in high school that you would see six people marching down the street with signs yelling about something and it wouldn't even phase you. You had no idea what they were about and you didn't care. I thought the era of the protest was dead. I figured that much as society had become harder to shock we were past the point where protests were a viable means of getting attention for an issue. "Yeah my mom is that berkeley. She took me to the riots in Feb 2008 over the code pink disputes. This is where the oakland, richmond and berkeley riot control was there in the streets near berkeley high. 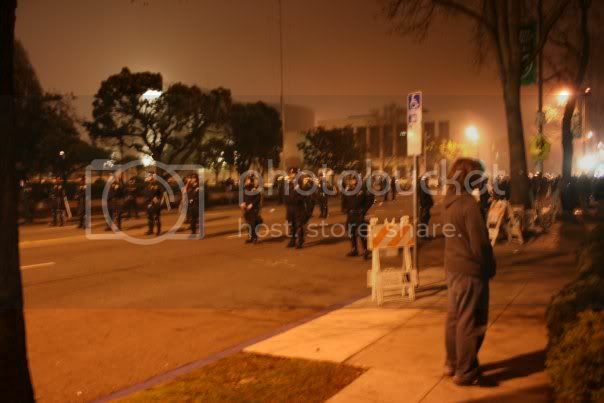 I also was in the sit down protest that day, but here is a pic at 11PM out front the police department." ....because when you came home from Lincoln (soon to be Malcolm X) elementary school you found Mom already home from work early because her office above the store on Telegraph Ave. had been tear gassed. …she bought you matching "One Voice Pro Choice" T shirts at the march when you were about 13. …she started a petition to save the veggie car from being impounded. …that as a little kid you whined, "Oh, not ANOTHER peace march!" because for just one day, you wanted to be left alone to play with your decidedly un-pc Barbies... and Little Kiddles. …she marched you in a stroller during the 1975 B.U.S.D. Teacher's strike! ..she was arrested for protesting at age 9. …that we took a day off school to go "March on Gallo" down Telegraph Ave.
…my brother was tear gassed in his stroller during a protest march on campus. …her social life used to consist of going with friends to get arrested outside of Livermore lab. … that even when she isn't in Berkeley, she still goes to protests and sit-ins. …you had no choice but to march in every 'Right to Choose' rally. …she didn't get upset with you for coming home later than expected because you were out running from the cops after a protest turned into a riot. …she wheeled you to a People's Park protest in a stroller. …she made you and your brothers give water from a hose to all the passing anti-Vietnam War protesters marching by your house because it was a really hot day! My mom actually got tear-gassed at Sproul during the Vietnam protests. She worked in a typing pool in that building, and the Blue Meanies (Alameda County Sheriffs' Dept) gassed the quad repeatedly, would invade the building with bayonets fixed onto their rifles, and would harass all the women who were just employees there. My mom was so rad though i dont think i realized it until i was at least 25. She let me miss school when I was 12 to go to the city for a "right to choose" protest with my best friend.